The Modesto Area A’s began the Swap Meet in 1965, located in the McHenry Shopping Center in Modesto. The event quickly outgrew the space available and in 1966 moved to the Stanislaus County Fairgrounds located at 900 N. Broadway, Turlock, CA. 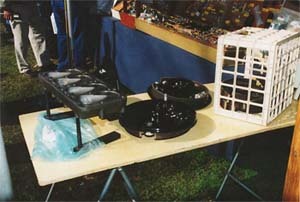 95380, and became known nationally as the TURLOCK SWAP MEET. It has become one of the premier events in the hobby of restoring and collecting antique and classic automobiles. 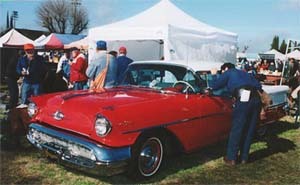 The TURLOCK SWAP MEET always takes place during the last full weekend in January. In 2020, the Swap Meet will take place January 25th and 26th. The hours of operation are Saturday, 7 AM to 5 PM and Sunday, 7 AM to 3 PM. Admission is $10.00 at the gate on Saturday and $5.00 on Sunday; children 12 and under are free when accompanied by an adult. For your convenience, an ATM is located in front of the Main Kitchen, which is near the Information Booth. There will be others spaced around the meet. Please click on any of the buttons above to get information on specific areas of interest. Volunteers In Patrol, Turlock Police Dept. Income earned by these clubs helps to fund their community projects and activities. ABSOLUTELY NO DOGS (SERVICE DOGS EXCEPTED), FIREARMS, OR CONTROLLED SUBSTANCES ALLOWED ON FAIRGROUNDS! ALSO, NO CRUISING OF MOTORCYCLES, BIKES, CARS, GOLFCARTS, MOPEDS, SCOOTERS OR ANY OTHER MOTORIZED CONVEYANCE IS ALLOWED. THIS IS A FAIRGROUNDS RULE. ONLY SMALL HANDICAPPED VEHICLES DESIGNED FOR AND USED BY HANDICAPPED PERSONS ARE ALLOWED.